GUTHRIE, Okla. – Paul Tierney has been in the lead heading into the final round of the Timed Event Championship of the World. Paul David Tierney hasn’t. He’s 24 years old competing in the “Ironman of ProRodeo” for just the third time. But he has a fine pedigree; his father is ProRodeo Hall of Fame inductee Paul, a five-time winner of this prestigious event. Now the second generation is five runs away from clinching his first gold buckle. In heeling, Tierney posted a 23.8-second run, which slowed him a tad. But he still finished with a 79.1-second round, the sixth-fastest on Saturday night. So what does that mean for the final round Sunday afternoon inside the Lazy E Arena? “I’m going to make five practice runs,” said Tierney of Oral, S.D. After his heeling mishap, Tierney held just a four-tenths of a second lead over then-No. 2, K.C. Jones of Burlington, Colo. Tierney then made solid runs in the final two events, steer wrestling in steer roping. 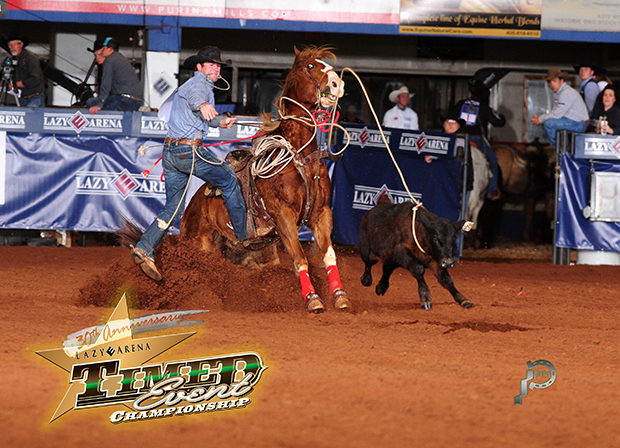 Meanwhile, Jones struggled in steer roping and fell to fourth place in the average. Russell Cardoza of Terrebonne, Ore., is third. Erich Rogers of Round Rock, Ariz., posted the fastest round on Saturday night, roping and wrestling five head in 52.5 seconds. He owns the second fastest round, which would be worth $6,000 in the fastest-round of the competition. AVERAGE LEADERS: 1. Paul David Tierney, 257.9 seconds; 2. Clay Smith, 276.2; 3. Russell Cardoza, 277.2; 4. K.C. Jones, 285.4; 5. Daniel Green, 322.0; 6. Clayton Hass, 339.4; 7. Dustin Bird, 340.7; 8. Landon McClaugherty, 357.7. ROUND 3: 1. Paul David Tierney, 49.0 seconds; 2. Russell Cardoza, 55.9; 3. Dustin Bird, 64.3; 4. Jess Tierney, 64.5; 5. Mike Outhier, 68.2; 6. K.C. Jones, 70. ROUND 4: 1. Erich Rogers, 52.5 seconds; 2. Clay Smith, 56.9; 3. Russell Cardoza, 62.8; 4. Mike Outhier, 65.4; 5. Paul David Tierney, 70.0; 6. Daniel Green, 79.1. FASTEST ROUND LEADERS: 1. Paul David Tierney, 49.0; 2. Erich Rogers, 52.5; 3. Russell Cardoza, 54.6 seconds; 4. Russell Cardoza, 55.9; 5. K.C. Jones, 56.7; 6. Trell Etbauer, 56.8.